Temperance Bliss—poor little orphaned rich girl– is a budding journalist working for Charles Dickens. She’s about to announce her engagement to her childhood sweetheart. AND the illustrious Mr. Dickens wants her to write a special article on the evils of gambling. 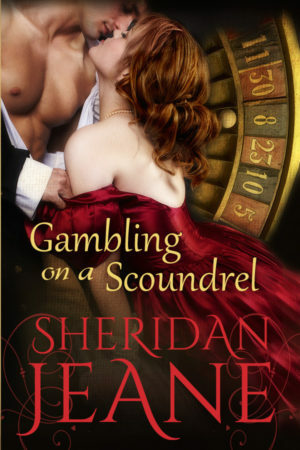 Her future looks bright until the morning when everything goes wrong and she not only receives a Dear Jane letter from Ernest, but also gets banned from the mysterious Lucien Hamlin’s gambling palace. What’s a journalist to do? Buckle down and work harder! Tempy digs deep and decides to win back Ernest’s love and turn in the best article on gambling Mr. Dickens has ever read. Lucien is a self-made man with a big secret… his true identity. He’d believed his family had been disinherited, but his life is about to be upended because he’ll soon be announced as his uncle’s heir—to an earldom. It’s a fact he’d rather not have announced, and certainly not in the newspaper, until after the sale of his casino. The last thing he needs is a journalist nosing into his affairs, even if she happens to have a very pretty nose. Temperance vows to win Ernest back. To do so, she simply needs to become the kind of woman he can’t resist. It’s a journey of self-discovery, one in which she learns more than how to walk and dress… she learns what really matters.